There are currently 25,262 users on this website. Hello! My first post as a new member. 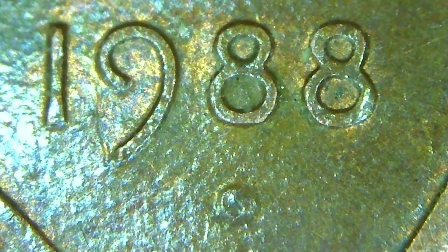 I found this 1988 Lincoln penny in pocket change and it has a curious "dot" below the date. Any suggestions as to what this could be? To CCF! Looks like a zinc rot bubble starting to form. It's Post Strike Damage ( PSD), not an error. It's worth face value. Possible split plating with a straight pin. The zinc gets air an rises. spendable. Thank you, both, for your expert words of wisdom. I found it odd that the dot was right where the D would have gone if it was a Denver mint penny. 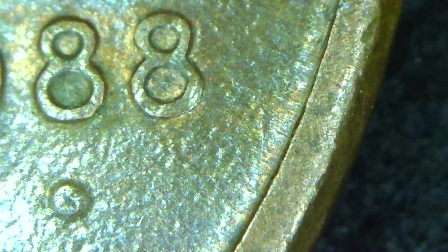 People often do weird things to coins, causing them to get altered.